The 31st Annual Pine Grove Rhubarb Festival is Saturday June 9, 2018! Bring your family and friends to our annual benefit for the THE PINE ELK CREEK IMPROVEMENT ASSOCIATION with a portion of the proceeds going to THE NORTH FORK VOLUNTEER FIRE DEPARTMENT. 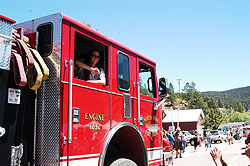 The festival is held at North Fork Fire Station 2, 16675 County Rd. 126 Pine, CO 80470. Enter your favorite Rhubarb Dish by 11:00 am for the baking contest and you could be crowned King or Queen and ride in the parade as Rhubarb Royalty. After the parade there will be lots of family fun with carnival activities for the kids, live music from local bands and shopping for the beautiful arts & crafts of local artists. Past winning recipes and long time traditional favorites are published in the Rhubarb Cookbooks that will be for sale. The 30th Annual Pine Grove Rhubarb Festival is Saturday June 10, 2017. Bring your family and friends to our annual benefit for the Pine Elk Creek Improvement Association and the North Fork Fire Department. The El Jebel Shriner's mini cars and Smokey Bear have been among the many who participate in our fun parade. The 28th Annual Pine Grove Rhubarb Festival is Saturday June 13th. The 27th Annual Pine Grove Rhubarb Festival is Saturday June 14th. 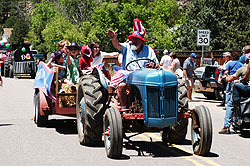 The 26th Annual Pine Grove Rhubarb Festival is Saturday June 8th. The El Jebel Shriner's mini cars and Smokey Bear have been among the many who participate in our fun parade. After the parade there will be lots of family fun with carnival activities for the kids, live music from local bands and shopping for the beautiful arts & crafts of local artists. Bring your family and friends to our 25th Anniversary celebration to benefit the Pine Elk Creek Improvement Association and the North Fork Fire Department. The El Jebel Shriner’s mini cars and Smokey Bear have been among the many who participate in our fun parade. After the parade there will be lots of family fun with carnival activities for the kids, live music from local bands and shopping for the beautiful arts & crafts of local artists. Festivities start early - more details to come!! Rhubarb Cooking Contest - The winners will be crowned the Rubarb King and Queen and get to ride in the parade! Sponsored by the Pine/Elk Creek Improvement Association to benefit the North Fork Fire Department.